​Living in Nashville has lots of advantages. We are finally starting to get the recognition we deserve as a top-notch destination for culture, food, fun, and history. These things that put us on the map draw more and more people to visit our city and also choose to stay. This is great, but as people decide to make Nashville part of their personal history, we need to reflect upon the role that Nashville has always played our national history. 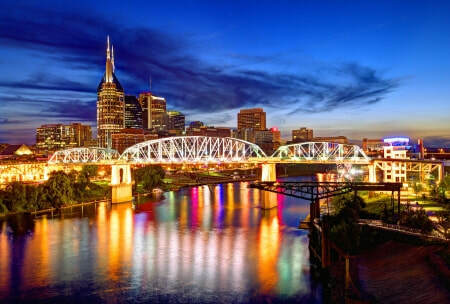 When most people think of Nashville’s intersection with the world, they conjure colorful sights and sounds from the music, personalities, politicians, writers, and trends from the Music City. Today, we’re going to honor and reflect upon one of the more essential intersections of our nation’s history and the people of Nashville. I’m talking about the Freedom Riders and their role in the civil rights movement in the 1960’s and what inspiration we can draw from that. There are lots of great books and documentaries about this moment in the civil rights movement. One of the better depictions I’ve seen is the relatively recent Freedom Riders documentary, which you can view here: https://youtu.be/66_kqSG6aHI Frankly, I believe it should be required viewing for anyone who wants to recognize the embodiment of courage. I’ve been honored to meet and have conversations with the late John Siegenthaler and several of the Freedom Riders themselves. Their tales and first hand accounts are as hair-raising as they are illuminating. Beyond the shock of what they encountered, I remain struck by their calm resolve and steadfast belief in non-violent resistance in the face of certain imprisonment and harsh police brutality. They were merely doing what they knew was right and were expecting negative consequences. However, they underestimated the significant resistance and backlash they were soon going to encounter. I recall Siegenthaler telling me, "It’s not like I had ever had my head bashed in before - I honestly didn’t think I would experience that kind of violence - until I did." If that happens to the Assistant Attorney General trying to keep the peace - what is likely to happen to everyone else? Many of these Freedom Riders originated in Nashville. They organized and trained here. They came from all walks of life. None thought themselves as heroes, nor were they acting for the sake of notoriety or widespread acclaim. They put their affairs in order and signed their wills before boarding those buses. They said goodbye to loved ones and put their lives on the line to do what they knew was right. If that isn’t courage, I don’t know what is. May we all have the clarity to hear that kind of certainty in our lives and have the courage to act upon it. From time to time I plan to identify and expand upon a few virtues that I believe to be essential to success and found helpful in the desire to live a meaningful life. I’ve decided to address twelve of such attributes this year. The first one that makes my short list of ‘most important’ is Courage. Winston Churchill seems to be experiencing quite the renaissance these days. I suppose there are lots of reasons why, but recent films, books, and TV series have chosen to feature him prominently at this particular moment in time. He was, in his own time, an extraordinary leader at a similar pivotal moment in world history. The world found it’s teacher at just the precise moment of uncertainty and indecision. Among many, what lesson did a grateful world learn? In this quote, He indicates that action is what matters most. Outcomes are the result, not an action in and of itself. Outcomes represent the past and leave it to historians and critics to judge their quality and importance. The action represents the present, and therefore, the only thing of which we have complete control. What drives that action? Courage. The courage of knowing that a sincere truth will never be false. So, here's the question we need to ask ourselves today: In spite of past outcomes, what do you have the courage to continue? Are you doing it? Why, or why not?